lap record of 99.64mph in his final outing. lead and he headed the pack at the end of the opening lap. (Honda 600) was third home, more than six seconds further back. nearly seven tenths of a second ahead of Norbury. caught the slower traffic, crossing the line almost two seconds clear. got by Mort to win by just four hundredths on the last lap. Norbury was third. after taking a fourth and two fifths. finally by just under eight seconds in the third outing. beat Jon Wright’s Steel Frame by over six seconds. allowing Ganderton to get by and win by half a second. with Ganderton in front, two and a half seconds ahead of Wright. ahead of John Nicklin who had a fourth and two thirds. just four fifths of a second behind, after setting the fastest lap of the race. seconds, with Nick Jefferies third, over six seconds further back. the red flags in the final race. Tony Griffiths and Ephgrave third. damaging the piston and forcing to fit a new engine. beating home Dave Thorpe (Ducati) by almost four seconds. fourth home, six seconds down on Thorpe. seven seconds in front of Thorpe, with Roger Smith (Ducati) third. Cornes at the hairpin on the last lap to grab victory. Hadwin eight seconds further back. ahead of Hadwin, with Cornes third on 28.
leads the championship on 35, five more than Griffiths. (Kawasaki) was a distant third, under pressure from Mark Disley (Kawasaki). 12 seconds from Disley, with Millard third. Millard on 31 and Disley third, with 29.
race one and was then over 22 seconds ahead of Millard in the next. table on 40, with Millard second on 33 and Tony Griffiths third with 32.
need it and that they play such a large part in motorcycle racing. places. Culley is third three points further back. Edwards battled it out in the Forgotten Era up to 250 class. failed to finish in the third. 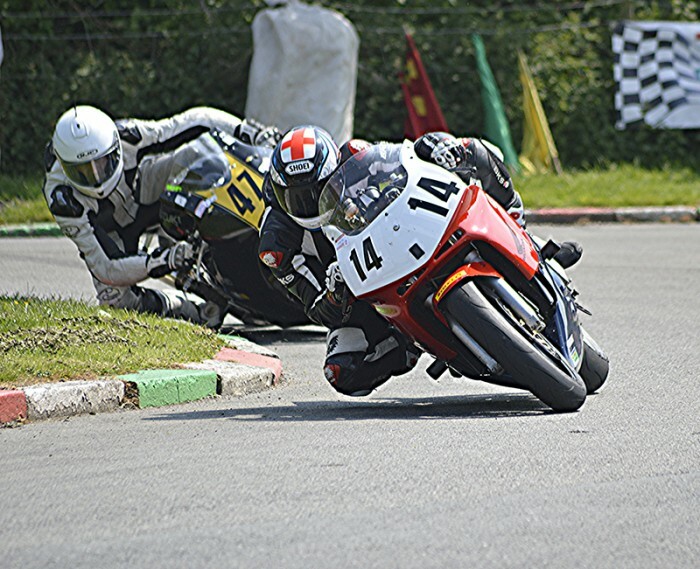 Dave Edwards now has 29 points and Huw 20.
kindly supplied by Mike Chorlton of Oswestry, in the 451 to 1100 Open class. bigger machine in a very competitive class. (Spondon Yamaha) retired after just two laps in race one. from Adam and Tom Christie (LCR).